Our approach focuses on application of techniques we developed for the spectroscopy of molecules adsorbed on surfaces to astrochemical problems such as adhesion to dust grain models and detection of molecular entities in various interstellar ices. Our unique approach combines the most accurate methods of quantum chemistry with advanced nuclear dynamics theory in order to explore a lesser known part of astrophysics at the solid-gas interface. This field has implications for planetary formation, origin of carbon reservoirs, exoplanets and origins of life, to name a few. In order to explore the interactions between molecules and surfaces (which helps us predict the fate of molecules near a surface) and determine how their internal energy changes once they experience vibrational or electronic excitations, we make extensive use of our in-house high-performance computing facility (VIPER). We also develop new methodologies to compute those interactions on hybrid hardware such as graphics cards and many integrated core architectures. 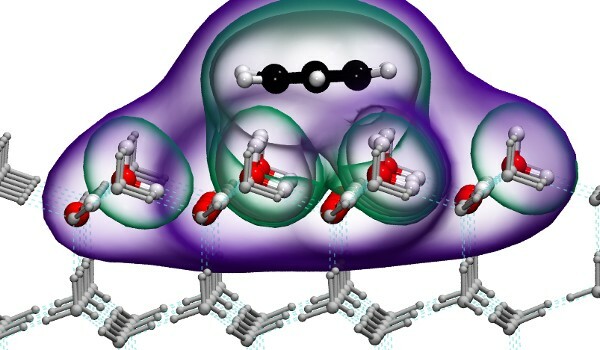 Image: visualisation of the various interaction zones in a benzene–ice Ih system. This technique is used to obtain highly-accurate interaction energies using a multi-technique approach.